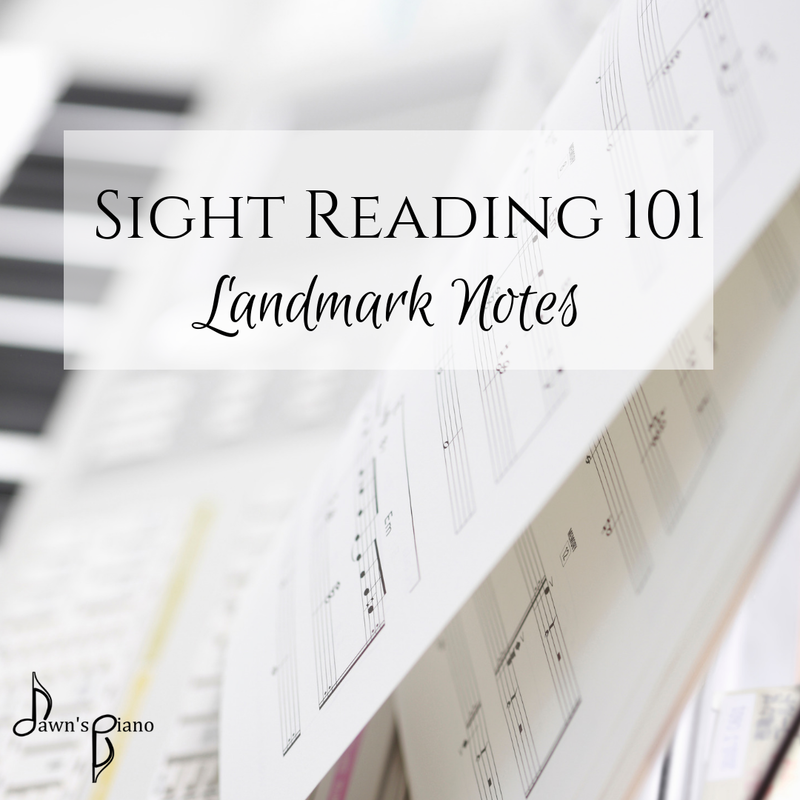 Here we go into week 2 of our deep dive into sight reading. If you missed last week's post and are wondering why we bother with this, check it out here. This week we're talking about landmark notes - what they are and how they help: Landmark notes are a handful of strategically placed notes, that when memorized, make sight reading simple & intuitive without having to memorize a bunch of mnemonic devices,* or memorizing the locations of every single note on the staff. The first 3 landmark notes are very simple. 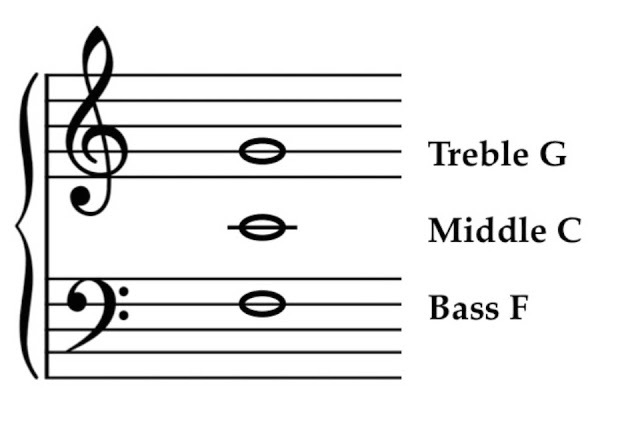 Middle C (the one with the 'whiskers'), Treble G on line 2 of the treble clef, and Bass F on line 4 of the bass clef. 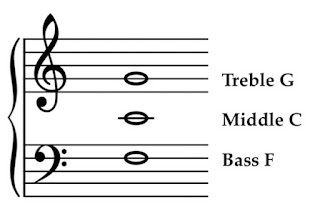 These are often the first 3 notes beginning students learn in their first few lessons with me, because learning these 3 from the start establishes the relationship between the notes & the staff with 3 easily distinguishable notes (they're not too close together). When we move forward and learn how to find the remaining notes, we reinforce the relationship between the notes as we learn how to read whether a note is higher or lower, if it skips or steps, etc. And this foundation of how the notes relate to one another carries over to all the notes that will follow and fluency comes much quicker. 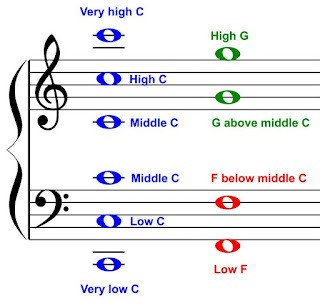 With beginning students who may get stuck on a note in a song or game, I'll encourage them to "imagine middle C" or say "we know G lives on line 2" and working from that starting point to move up or down, can they solve the note we're stuck on? As we grow in our music, our range gets larger and more notes obviously get added. When this happens, a few more landmark notes join our group. 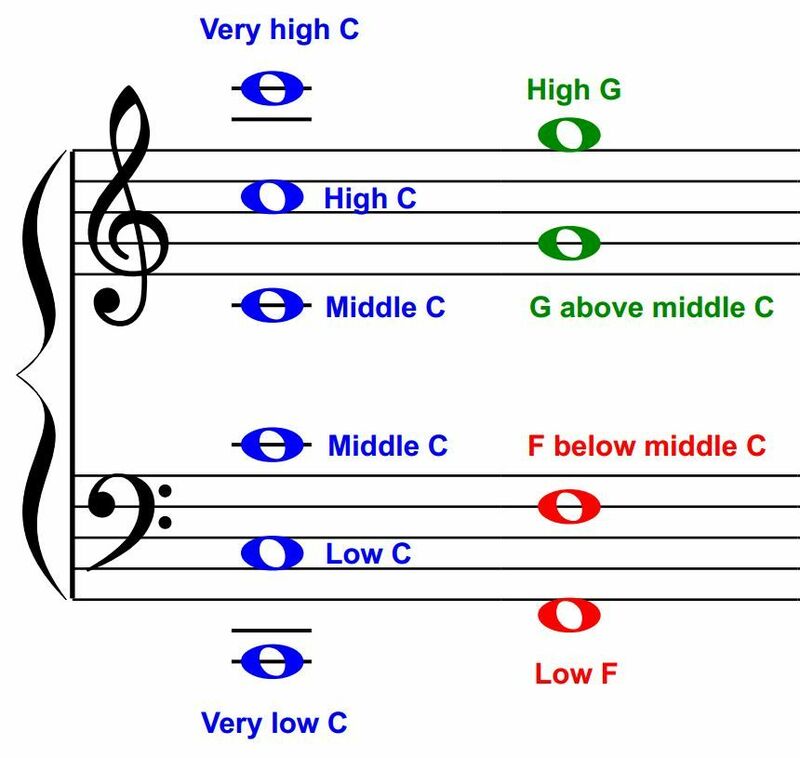 We'll gradually add high C, high G, and very high C in the treble clef, and low C, low F and very low C in the bass clef. In total at this point, we've only had to learn 5 different C's, 2 G's in the treble, and 2 F's in the bass. And really, that's all we need. Instead of memorizing 88 different notes on the staff, we've learned 9. Using these 9, we can figure out the remaining notes easily because we already understand that relationship between notes. One of my favorite ways to introduce landmark notes to young students is with this video of the barnyard friends. In addition to 5 of our landmark notes, the video also introduces a couple of the notes that live right around middle C. This lays the foundation for understanding the relationship between the notes I've talked so much about (more on that coming next week) while giving students a story to help remember the locations of all the landmark notes contained within the staff. In next week's post, we'll be learning all about that relationship between the notes with a discussion on the value of intervallic reading. *Quick note on mnemonic devices & why I choose not to use them. Mnemonic devices do not train students to understand the relationship between different notes that I talked about above, it's just straight memorization without any specific relationship to the keyboard or the staff. On top of that, in piano we have two clefs with both line & space notes, this means there are FOUR mnemonic devices students have to both memorize & remember which clef and line/spaces they associate to. In my experience, it ends up being a lot of mental gymnastics just to arrive at a simple note name, and instead of being a shortcut can be a troublesome detour when students use it as a crutch longer than they should. Instead, I choose to give my students the tools to figure out the notes from the beginning so they are building musical understanding, not just memorization, from the beginning.